Greetings from Archangel Michael. Indeed, you are surrounded with divine light. Indeed, you are in the presence of your team of Guides and Angels. We invite you in this time and space to breathe, relax, and shift your awareness inward. Focus your awareness on the area of your heart and breath into your heart center. As you exhale, let your heart light expand. Let your heart light vortex open, expanding all around you, surrounding you completely with the golden awakened heart light. Continue to breathe and deeply relax as you become aware of the light of your heart glowing, shimmering, and expanding all around you. Continue to breathe and deeply relax as you become aware of the light of your heart glowing, shimmering, and expanding all around you. As this orb of heart light remains intact around your entire being, we now draw your awareness to the column of light extending upwards from your heart, up into direct presence with source above and flowing down from above. Light flows down through the top of your head, along your spinal column, down along your legs at the bottom of your feet, and all the way to the light at the core of the crystalline earth. Light flows down through the top of your head, along your spinal column, down along your legs at the bottom of your feet, and all the way to the light at the core of the crystalline earth. This column of light, of crystalline light, unites all chakras as one. All seven chakras of your physical body and all 12 chakras of your spiritual form are united in this crystalline column, this ascension column of light. Tune into the light of this column, letting it expand around you, letting it glow more and more vibrantly, attracting light from every corner of the universe, from the divine, from the earth, from all around. Light is flowing in from every direction to strengthen this column flowing along your core. Feel your spine light up. Feel your mind light up. Feel your body, mind and spirit become fully illuminated with this ascension light, the crystalline column of light. You are the bridge in between the light that links heaven and earth. You are awakened, activated, shining vibrantly with light. Become aware of the light of your ascension column simultaneously flowing from below to above and from above to below. Visualize now an outer orb of light. Your heart light orb is still intact, but out beyond this, your light body orb brilliantly flows a divine torus of light. The sacred geometric form of the torus flowing like a donut shape up into the light and reaching out around you. It creates a bubble, an orb of light, that is simultaneously flowing up and around, down below and around this crystalline golden awakened light of your light body. Breathe and expand into this. Shine more brightly as this, your awakened light body radiantly glows, attracting a finer, higher quality of light towards you in this present moment. It attracts blessings, high vibrational energy, and light. Elevate in this light now to expand further, to recognize your connection and awakened heart light. Become aware of your connection to all awakened humanity, your oneness and unity with all beings. Take a moment to send light forth towards all of humanity and now in return, receive love, light, awakened crystalline consciousness back multiplied. For when you give, you receive tenfold. When you serve, you are not only assisting others, you are expanding, becoming more vibrant, glowing more radiantly, and embodying a higher level, a higher quality of your pure source light. Become aware of your part in the awakened human heart grid and now expand further to the crystalline grid level. This grid connects every point on Gaia, the awakened 5D template for the new earth, the joyful, blissful, peaceful, loving golden light of the new earth. Receive the downloads, the light packets, the codes of awakening, and the frequencies from the crystalline grid which will most serve you now. They download now into your highest quality DNA, into your mind, body and spirit. Download light, frequency, and love. Feel yourself pass this on. That which you have received goes out to humanity, to the physical earth grid, to the human heart grid, and to all beings. 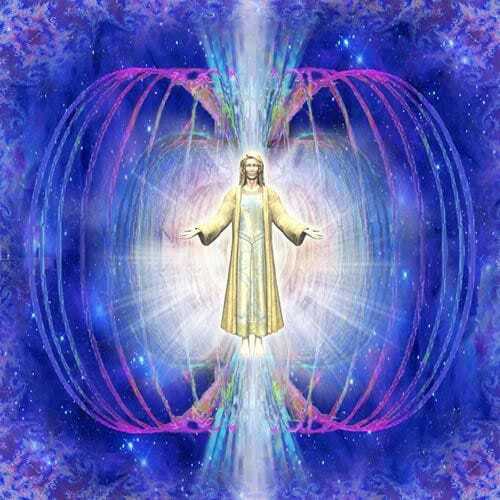 Become aware once again of your heart light vortex, your light body, your oneness with the human heart grid. Expand to source level to experience pure unity consciousness, your interconnectedness with all that is, with all light, all night, all of existence – multiple, parallel, past, possible dimensions and experiences. Experience, feel, observe your oneness with this now. Focus on your heart glowing vibrant. Focus on your spine illuminated with light. Focus on your aura, shining and sparkling with love and positivity and presence. Tune into your light body, your expanded state of awareness. Breathe, let your heart light vibrantly glow, let your light body radiantly shine. Now return your full awareness to your hands, feet, and to this moment here and now. Bring this awakened Christ light, crystalline light, source light, the unity of love, the awakened consciousness, the awakened perspective and presence into your day. In every moment, return to the vibration of love and presence glowing vibrantly, shining radiantly as the awakened light that is one with source and all of humanity. You are love, you are light. Continue to shine. Return to your physical body cleansed, purified and energized. And so it is.